A herniated disc causes severe pain in the back that carries through all the way to the legs. Even the simplest activities and movements can cause discomfort and prevent you from being active. At The Spine Center, Doctor Saqib Siddiqui takes a cutting-edge approach to treating herniated discs. He uses the latest minimally invasive procedures to correct herniated discs so you can live a more active, pain-free life. The bones along your spine are cushioned by small discs. These discs allow your spine to stay flexible so you can easily bend, twist, walk, run, lift, and make other common movements. These discs can get damaged and bulge out or break open, pinching spinal nerves and the spinal cord. This condition is called a herniated disc. 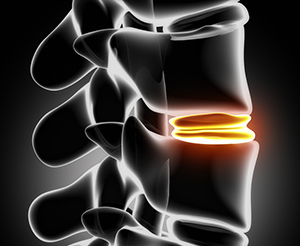 Herniated discs can be caused by a wide range of factors, including simple wear and tear of the disc as you get older and sudden injuries, such as falls and car accidents. The best way to know for sure if you’re suffering from a herniated disc is to schedule an appointment with Doctor Saqib Siddiqui at one of The Spine Center’s convenient locations by calling (954) 916-7062 or scheduling a consultation online.